Memorial day has always been one of those strange days for me. One where I'm filled with gratitude for the sacrifice that our fighting men and women have made, but at the same time the day is tinged with sadness. It's sad that they had to give their lives, or make such sacrifices – and that there is such evil in the world that requires their sacrifice be made. My grandfather was in the US Army Air Corps in World War II, and while he wasn't killed in action, he was shot down and served several years in a German POW camp. I'm sure he was changed by the experienced, but he never let on very much to his grandchildren about all he had been through. I'm sad that I didn't get more of an understanding of his experiences as he went home to be with the Lord in his sixties, far too young. So today, I'm thankful for his sacrifice, as well as the sacrifice of all the thousands of other fighting men and women who have given their lives in support of freedom. Thank God for them. Memorial Day is a United States federal holiday observed on the last Monday of May. Formerly known as Decoration Day, it commemorates U.S. Service Members who died while in the military service. First enacted by an organization of Union veterans — the Grand Army of the Republic (GAR)— to honor Union soldiers of the American Civil War. It was extended after World War I to honor Americans who have died in all wars. 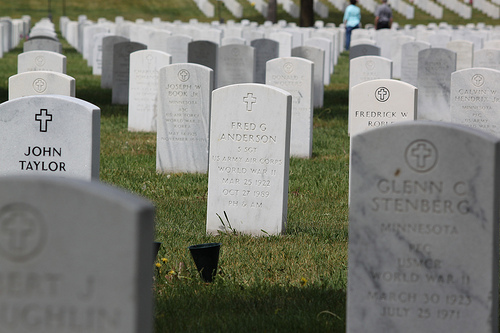 Begun as a ritual of remembrance and reconciliation after the Civil War, by the early 20th century, Memorial Day was an occasion for more general expressions of memory, as ordinary people visited the graves of their deceased relatives, whether they had served in the military or not. So thank you to all those who have given their lives in the service of our country, and for those who served, and who have passed before their time. We will not forget you, and we honor your sacrifice.